The key to keeping smiles healthy at every age is visiting the dentist for preventive checkups and cleanings two times a year. 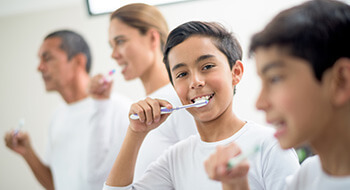 In conjunction with great oral hygiene routines at home, these visits will establish a solid foundation for your child’s lifetime of healthy, happy smiles. If your child has recently developed a tooth or is celebrating a first birthday, call our team to schedule their first visit with Smile More Kidz of Tappan, NY today. During these regular office visits, we will carefully and gently evaluate your child's smile for signs of tooth decay, dental damage, or developmental concerns. A skilled hygienist will carefully clean all areas of your child's smile, demonstrate proper teeth cleaning methods and work with your child to understand dental health. Before you leave our office, we'll work with you to develop a plan for your child's ongoing oral health care. Dental sealants – clear coatings that place a physical barrier between teeth and plaque and tartar buildup to reduce risk for tooth decay and gum disease for kids who are still learning to brush and floss. We simply paint a thin coat of sealant onto teeth and use a curing light to harden the sealants into position all in one short appointment. One sealant application can protect your child’s smile for years. Fluoride treatments – used to strengthen tooth enamel to prevent the risk for cavities, topical fluoride treatments, applied during six month appointments, can help young patients keep their smiles healthy. Diagnostic screenings – we’ll check for warning signs of developmental concerns, and use digital x-ray technology to monitor the changes in tooth structure. Wisdom tooth consultation – around the age of twelve or thirteen, we should be able to see your child’s developing third molars often called wisdom teeth. At this time, we can start offering guidance to help you plan for extraction if necessary. We’ll monitor wisdom teeth throughout development, and if they need to be removed to prevent dental drift, crowding, and other concerns, we can often perform these extractions as well. Orthodontic assessment – as your child’s primary and adult teeth erupt, we’ll also offer orthodontic assessment and recommendations. We offer both traditional braces and alternative orthodontic options. It's important that parents serve as good examples for their children when it comes to caring for teeth. That starts by caring for your child's teeth when they're too young to do so on their own. Even before teeth erupt from the gums, you should clean their soft tissue with damp rag after feedings. You should also avoid allowing your child to fall asleep with bottles in their mouths, as this allows sugars to sit on teeth leading to rot. As soon as your child has one visible tooth, start brushing it twice a day with a tiny, grain size, amount of toothpaste. When your child has two teeth that touch, start flossing once a day. Once your child can hold a toothbrush, start letting them brush their own teeth with your help. 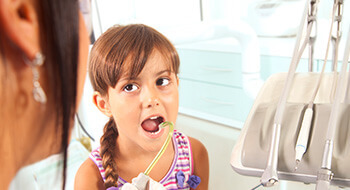 Gradually, let them do more and more of their own teeth cleaning under your supervision.